Lush have brought out the Candy Mountain bubble bar for quite a few years running now and every year it's had a little make over. Last year I seem to remember it was green and pink and went a bit of a weird colour in the bath, but this year's make over is fantastic!! It's pink and white swirls and spots with shimmery lustre. The lustre is a new type created by Lush this year called snowflake lustre and it's kind of an iridescent glitter shimmer; it's beautiful! Bubble bars are really easy to use; crumble half into the bath and run the water to create mountains of bubbles. What was really cool about Candy Mountain is that I noticed it had a kind of softer pink middle. I looked on the Lush website and it says it's a bubble crumble mix that actually turns the bubbles pink! How cool is that!? 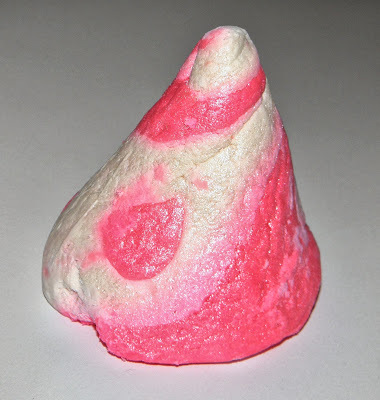 Candy Mountain has the same fragrance as Snow Fairy which is very sweet. It also contains Fair Trade Vanilla Absolute (Fun fact: Lush are the first cosmetic company to use Fair trade vanilla absolute). I enjoy using this bubble bar as I'm into the very sweet Lush fragrances and it's pink and shimmery which is great for me! It makes loads of bubbles and looks really cute; I think this Christmas Lush have made the best Candy Mountain yet! Love the look of this, anything to make a bath pink. Such a funny shape too! Ouuuu I love Lush's products! Especially if it smells like Snow Fairy!! Must try this!